If you’re an animal lover, an animal shelter can be a depressing place. For decades, the reputation of Oakland’s mismanaged shelter was no exception. 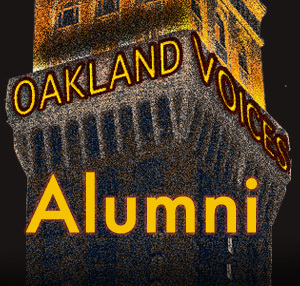 But as is often the case in Oakland, when a city agency flounders, a cadre of volunteers and activists come together to work with—or around—the city. Oaklanders embody that underdog, Do-It-Yourself spirit partly out of necessity. Whether filling potholes, maintaining public parks, or helping improve the animal shelter, volunteers step up when the city falls short. 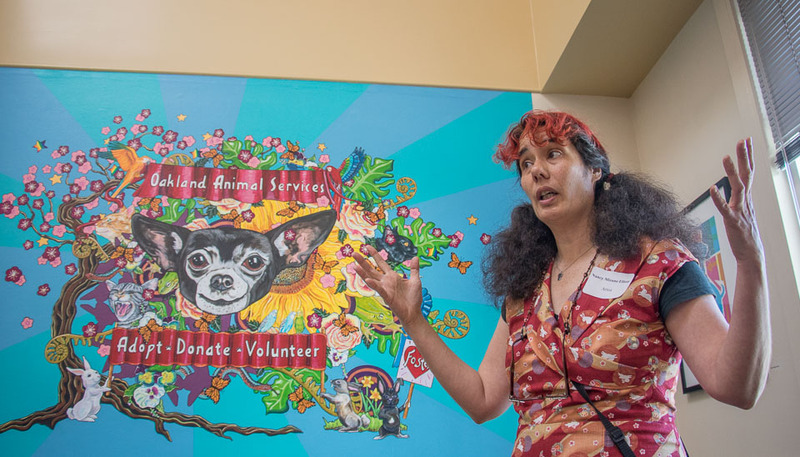 The new Paw Power Mural Project is the latest example of volunteer-led efforts to improve the Oakland Animal Services (OAS) shelter. Deeply rooted in the Bay Area artist community, Elliot is an Oakland-based artist and faculty member of San Francisco City College, where she also curates its gallery. As a shelter volunteer, Elliot was struck by the facility’s lack of artwork and cheerful colors. She reached out to shelter leaders with the idea of organizing a group of artists who would donate time to help beautify the dreary space. Located on 29th Avenue next to busy railroad tracks, the shelter straddles the borders of Oakland’s Fruitvale, Jingletown and the San Antonio neighborhoods. Built in the 1990s, the OAS facility looks like most unremarkable municipal structures of that time, built on a budget in a utilitarian style that values function over community-focused curb appeal. Approaching the shelter from East 12th Street, visitors are first greeted by the drab, cold gray walls of the back of the facility. From the street, it looks more like a mini-detention center than a place to find a family pet. Even the orientation of the building in relation to the street has its main entrance tucked away behind a series of low-level security gates. Thankfully, as part of the mural project, the security gates have been painted a cheerful yellow. In true DIY fashion, the team turned to an online crowdfunding platform to raise the money needed to cover the basic painting supplies. Since completing the first phase of the mural project, they have reached 71 percent of their fundraising goal. Supporters can still donate to help the second phase of the project bring more artwork to the shelter’s meet-and-greet spaces and outdoor dog runs. On April 30, 2017, the shelter hosted an event to celebrate the newly completed murals. The reception brought together artists, volunteers, donors, and shelter staff. The transformative impact of the new murals not only improve the experience for visitors but also help lighten morale for workers at the shelter. “As I park my car and walk up to the building to start my volunteer shift, I see the outdoor mural of cats frolicking on the shores of Lake Merritt and it makes me feel optimistic about my shift. It reminds me of why I volunteer which is to give the animals at the shelter a chance at a great life,” said shelter volunteer and professional pet photographer, Pipi Ray Diamond. Diamond regularly donates her services to photograph shelter animals, another vital volunteer contribution for a modern shelter since it’s been demonstrated that interest in an adoptable pet can increase with a high-quality photo. 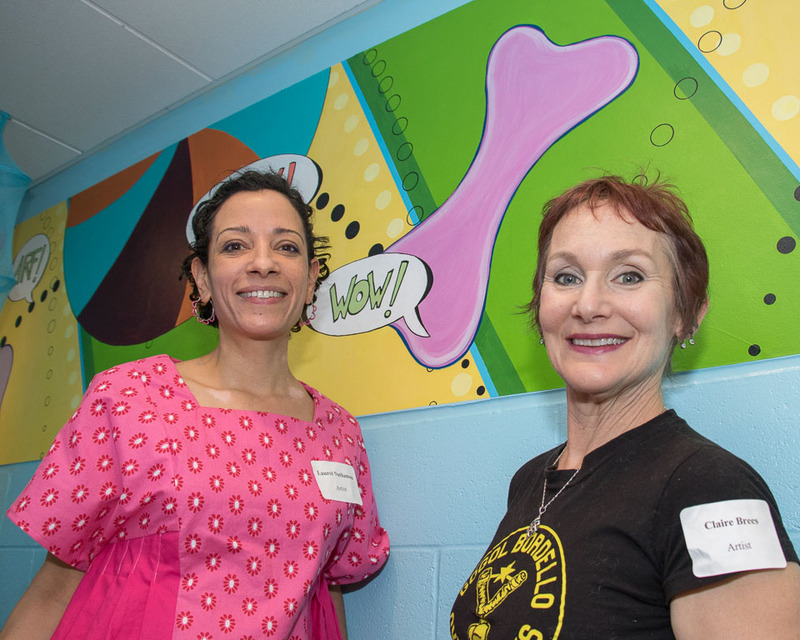 “From a photography perspective, I really appreciate that the puppy meet-and-greet room was repainted from a harsh yellow to a calm baby blue as part of the mural renovations. It’s made it easier for me to get good photos of dogs in that room,” Diamond added. Elliott also credits Oakland’s large artist community for getting the project off the ground. “It’s hard to ignore the Oakland art community. Throw a rock around here and you hit someone involved in the arts in some way. 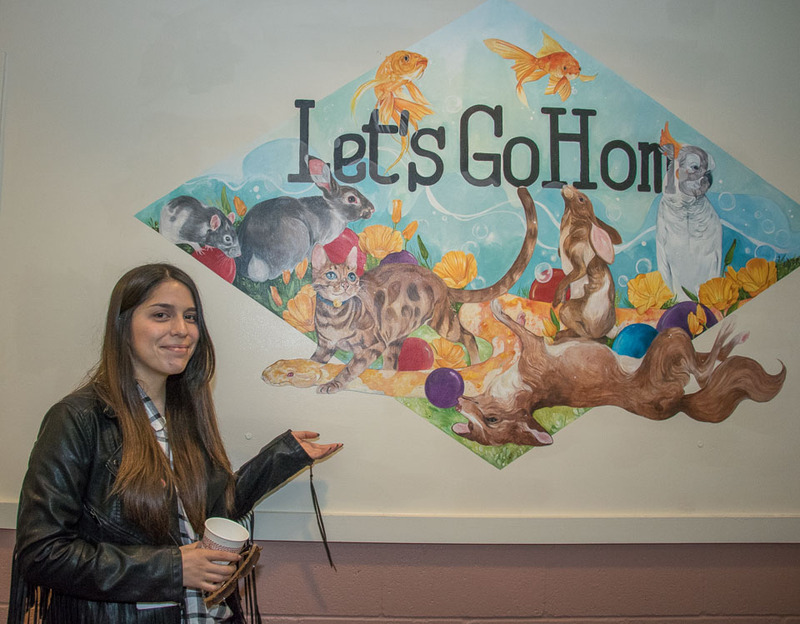 The shelter director immediately saw the connection between art and animals and how art can help improve the adoption experience,” she said. A positive environment can be key to supporting the modern “Adopt, Don’t Shop” animal welfare movement at shelters and rescue organizations. “OAS relies heavily on Cat Town as a partner for cat adoptions. The success of Cat Town is a shining example of how the environment impacts adoptions,” Elliott said, referring to Oakland’s unique cat cafe, where visitors can lounge on sofas sipping coffee and check out the “cat zone” where 8-24 adoptable cats roam freely to interact with their future families. Elliott also identified some artists who were known animal lovers or who incorporated animal imagery in their work. But most of all, the artists believe in animal welfare work. “They are all doing it for love. Their love of Oakland, and their love and deep connection to animals. They don’t need the exposure. They just had to find the time to make it work with donated money that just covers material costs,” Elliott said. One of the Paw Power muralists, David Polka, has donated his art to OAS in the past, as part of the “Home is Where the Heart Is” project. For that Valentine’s Day campaign in 2015, participating artists like Polka would paint a one-of-a-kind portrait of an adoptable animal and when a shelter visitor adopted the pet, their new family would get to keep the portrait, too. Dogs feature prominently in Polka’s artwork and hold powerful significance. “Dogs are a symbol of a companion, they represent something that follows you around, like a stray or a pet. Dogs make an easy stand-in for the life experiences, both positive and negative, that stay with us,” Polka said. With 12 new works of art, and more planned, the Paw Power Mural Project is helping transform the shelter, one splash of bold color at a time. The building’s visual makeover is a testament to volunteer-led changes throughout the facility. Artist Renee Castro with her mural. OAS takes in all the types of animals represented in her artwork. Photo: Pipi Ray Diamond. Nearly 15 years ago, when the shelter still fell under the budgetary purview of the Oakland Police Department (OPD), whistle-blowers stepped forward to expose a staggering range of abuses, from starving animals to even finding a live dog in a freezer meant for dead animal storage. Back then, there was about a 50/50 chance a lost animal might survive long enough to be reunited with its family or get adopted out to a new owner. Since that time, volunteers campaigned tirelessly to get the city council to vote to re-organize the city budget and increase funding so the shelter could separate from OPD, gain some autonomy, and modernize their operations. While the national trend shows animal shelters in the US improving through increasing the number of adoptions and decreasing the number of animals being put down, OAS still struggles. The shelter faces challenges in boosting its live release rate for dogs through adoptions, rescue group fostering programs, and/or transferring to other shelters where demand for dogs may be higher. Some dog rescue activists express ongoing concerns with Oakland’s high euthanasia rates compared to similar municipal shelters. 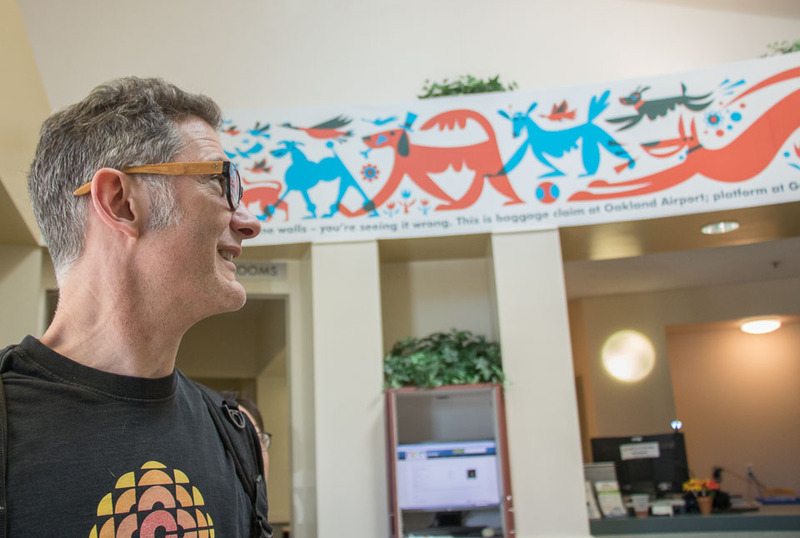 The mural project is a sign of the shelter’s ongoing growth and transition as OAS continues to shed its dysfunctional past. 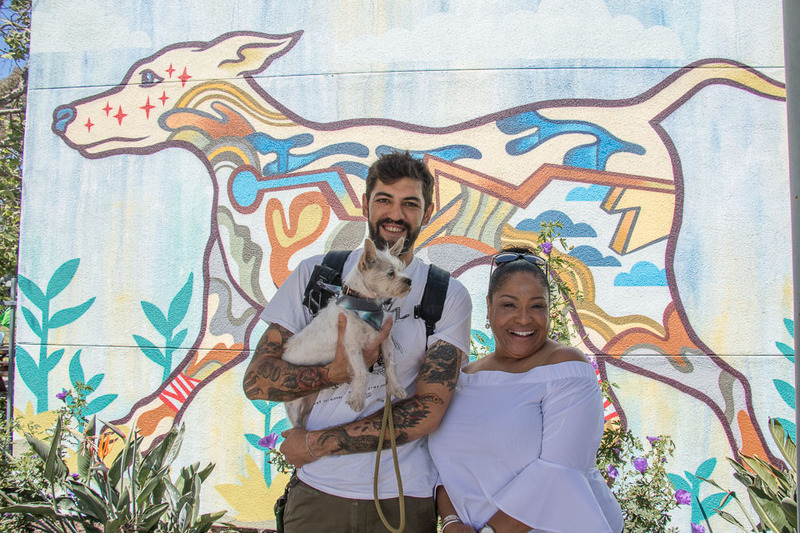 These murals provide a powerful marker for Oakland’s animal welfare community, demonstrating how far the shelter has come and how much potential for improvement the future holds. “There is always a combination of suffering and joy in animal welfare work,” Elliott said. You can support the PAW POWER! Mural Project by donating online for paint and supplies. Oakland Animal Services is located at 1101 29th Avenue, Oakland, CA 94601. Visit OAS to enjoy the new artwork in-person and meet adoptable dogs, cats, rabbits, and other animals. The shelter is open to the public Monday and Tuesday from 3:00-7:00pm, Thursday from 3:00-8:00pm, Friday from 12:00-4:00pm, Saturday and Sunday from 12:00-5:00pm.